Is anyone else still full from dinner last night? Same. Clint and I were in charge of Thanksgiving dinner for the first time and we were so pleased with how it turned out. Clint did a smoked turkey (we have this smoker) and then we made sort of minimal sides, including this AMAZING salad that my friend Jessica posted about last week. The leftovers today are going to be good. We’re also decorating the boys’ tree today, and I’ll share that here on the blog on Monday. So, the reason you all are actually here….the sales! I wanted to share what I’ve purchased on sale so far, as well as some other great sales I’ll be browsing today. Lisi Lerch // 30% off + $5 Shipping – the best statement earrings you will find! Not sure where to start, get these gold Ginger earrings. BaubleBar // 30% off! I bought these heart earrings as another fun statement piece. Also check out their holiday shop for fun, festive earrings! Well-Kept // 30% off with the code GIVE. I use the Fitness Wipes for my Peloton bike and for my mats at home. Plus their technology wipes are awesome for phones, iPads (especially for the kids) and your laptop. I keep at least 1-2 packs in my bag at all times! Banana Republic // 50% off regular priced merchandise. This is a great time to shop for winter workwear! J.Crew // 40% off your purchase with the code TOGETHER. I bought a few things but may head back to get this holiday party dress and these plaid PJs for the boys. Anthropologie // 30% off of your purchase. I’m tempted to buy these stockings for our house and this cozy sweater to wear when we go up north skiing this winter. Ann Taylor // 50% off everything with the code BLACKFRIDAY. I bought this skirt and this sweater last week but you can get them at a way better deal now! Old Navy & GAP // I put these together because they’re my go-tos for kids shopping and I did a bunch of that before this weekend started. Now you get 50% off at both Old Navy and GAP. It’s a great time to get coats, hats, jeans and, of course, Mickey gear at a great discount for your kids! Tata Harper // 20% off orders of $100 or more. If you’ve never tried the brand, start with the Regenerating Cleanser, Creme Riche and the Hydrating Floral Essence. They also have great gift sets! BURU // Get $50 off of $150! This is my favorite spot to shop for myself. If you’re shopping for another mom or mom-to-be (or yourself), may I recommend a Vive La Mere sweater. Neiman Marcus // Get $50 off of a $200 purchase. I bought this Rag & Bone Leopard tee already, but could also use some new jeans! Peloton // If you’re a Peloton rider, the boutique is 50% off! Nordstrom // Select items are on sale, including the perfect plaid coat (I was nervous this would sell out so I bought it on my phone between rides at Disney on the day it came out – it’s now under $150), Spanx leather leggings, and so many great buys for the kids! Hanna Andersson // We’re wearing Christmas Jammies! 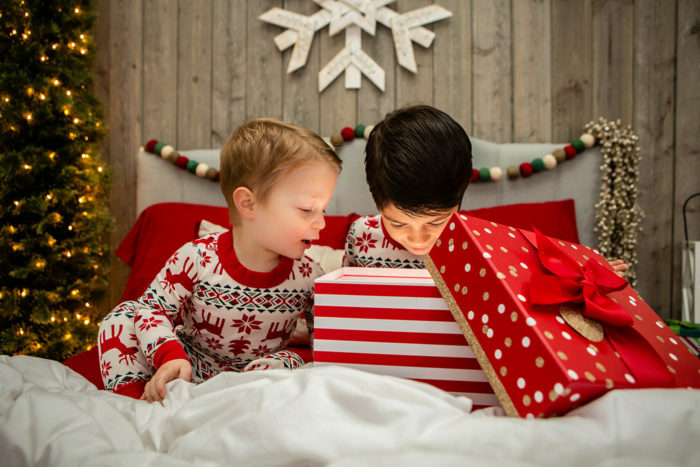 These are the best and so many styles of Christmas PJs are $25 right now – including what the boys are wearing in the photo for this post! Janie & Jack // When I’m shopping for fancy clothes for the boys, this is where I go. And they’re offering 30% off site wide! I bought these pants and this sweater from Banana Republic (at 50% off!). I think it’ll be a super cute, casual look for workdays at home. I also bought these shoes to go with the outfit. I’ve been in need of a hair dryer and a curling iron for a while now. i got my hair dryer on sale at T3 with the code FRIDAY18 and curling iron on Amazon. I shopped the BURU holiday collection and bought these pants and this party skirt for our upcoming events! We FINALLY got a new Christmas tree and it’s this one from King of Christmas. Their trees are 15% off with the code blackfriday15.